Next to Fashion Week, The Oscars and Halloween, one of my absolute favorite “holidays” kicks off this week – FOOTBALL SEASON! I don’t know about you, but I’m super pumped for the college football season to start! The hubs and I are proud grads of the almost unanimous #1 Party School – West Virginia University. In addition to a B.S. in glitter, I feel that feel that I have an unofficial doctorate in partying! 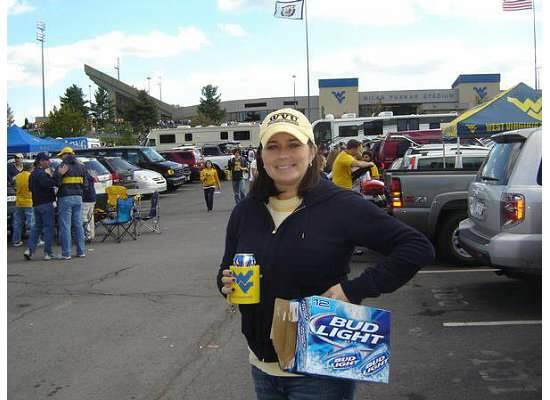 I’m so excited for football, I wanted to theme things up here this week by devoting every day to tailgate season. I’m plan to cover what to eat, drink, wear and tips for throwing a good party out of the back of your car. Today, let’s start with the food. My parents like to go all out and make warm dishes on site, but for me, I tend to keep things simple right now and just make things that 1. Won’t spoil too quick and 2. Don’t need to be heated. So here are my suggestions (with help from Shot of Mom!). 2. Taco Dip – shout out to my Chi O’s with this dish. Shot of Mom would make two batches – one for the tailgate and one for the late night snacking. Sue’s recipe = 1 jar of taco sauce mixed with 2 cream cheese blocks. Then layer with lettuce, diced tomatoes and Mexican cheese. 3. Jell-o Shots – of course in blue and yellow! Shot of Dad’s trick is to NOT use water. He replaces water with vodka. Yellow = pineapple Jell-o with pineapple vodka. Blue = blue raspberry vodka or regular vodka with some blue curacao. People in Pittsburgh – you can get mini cups with lids for shots at Mike Feinberg in the Strip! 4. Say Cheese – my go to is always a cheese plate. 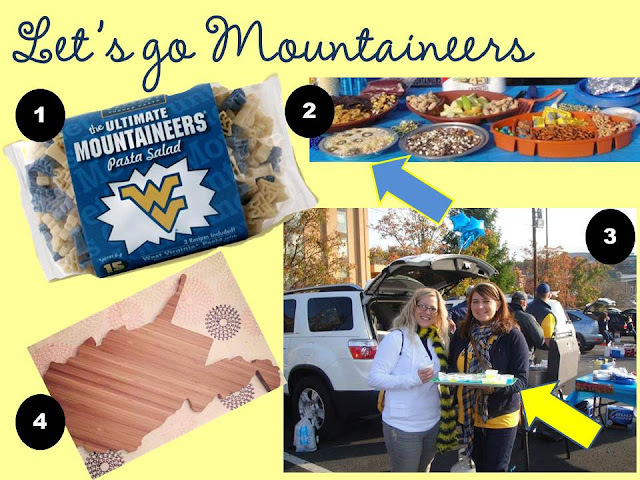 I basically just raid the cheese aisle and add some nuggets to my awesome state of West Virginia tray. My current fav is Robusto from Whole Foods. 5. Baked Potato Dip – a new one from Shot of Mom, she’s made this for some recent tailgates and it’s gone over super well. See below for the full recipe! · Fry bacon (if not using the pre-cooked) and drain on paper towels. · If using the pre-cooked, microwave according to package directions until crisp. · Cool and then crumble. · Cover and chill at least one hour before serving. · Serve with a strong potato chip. Sue used Ruffles Ridged potato chips, but if you are making this for an at home party, you can use waffle fries.